Liquid or “water damage” is the introduction of a liquid substance internally or externally on a device which will attack componentry vital to the successful operation of the phone or tablet. 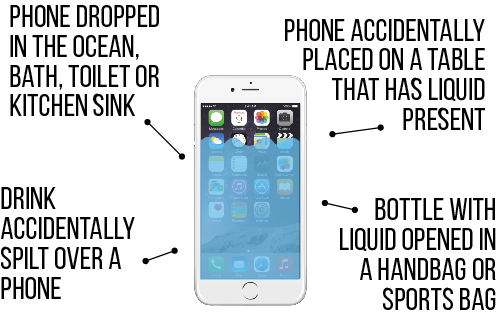 What liquid can harm a phone or tablet? If your device has suffered liquid damage, follow our step-by-step guide: Saving Liquid Damaged Devices. What type of liquid has the device been exposed to? How long ago was the damage done? Did you turn off the phone when it happened? How long til you turned it back on? Have you taken any steps to try and fix the phone since the damage? What symptoms have you had since then? Has the phone been repaired previously? What was the damage? When? Absolutely! 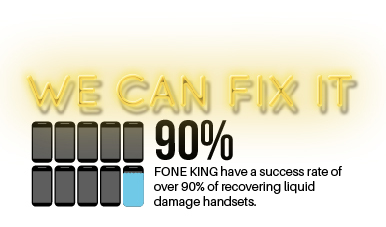 Fone King’s qualified technicians are experts at recovering liquid damaged phones. Our success rate depends on the type of liquid spilt on the device, the time since the accident and what precautions you have taken prior to bringing it to us.